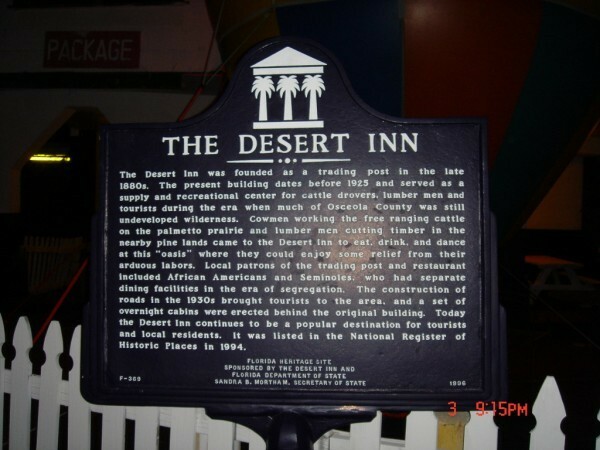 We arrived at the Desert Inn at about 7pm, we had decided to have dinner there and give ourselves the opportunity to talk to some of the locals, which provided us with some interesting stories about the area. During our interviews, staff report that they had experienced multiple paranormal events. One story told was of a patron having a beer and during the conversation he made derogatory remarks about the ghosts and his beer flew across the bar. Last year there was a fire started in one of the hotel rooms due to a careless cigarette that resulted in the death of this patron. The waitress, who has only in the past two weeks started working at the Desert Inn, stated that last week while closing up, one of the chairs was out away from the table, so she pushed it in. Went to the kitchen to turn off the lights and upon her return the chair was back out a good two feet away from the table. She says there was no one else in the restaurant at this time. Another story tells of a prior owner who used to have her meals at the first booth in the restaurant everyday, one day she evidently choked on her dinner. They say she is seen periodiacally in the first booth having a meal as she did so much of her life. Patrons also related to us that the juke box was a favorite tou of the spirits, since it would come on at any given time all by itself and play a song. When questioned they had not noticed if it was the same or a different, random song each time. At 9:00pm we started setting up our equipment. We chose to set up the video cameras in the bordello room, downstairs in the bar/dining room area and also one in the room where the fire had occured. We went lights out at approxiamtely 10:00pm. 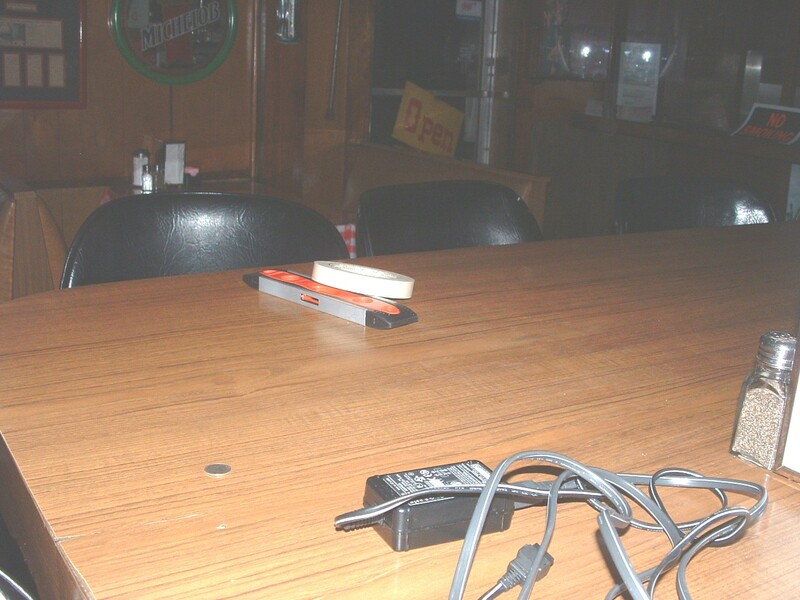 Our initial EMF sweep produced an average reading of 0.2, except for the back wall of the men's bathroom in the bar. This wall area produce a reading of 74. Further investigation revealed that this wall backed up to the restaurant oven and this was what was producing the high reading. The average temperate in the bar was 76, the upstairs bordello area was a little warmer at 80 and the hotel room was also 76. The reports from our teams were all in agreement about the hotel room with the recent tragedy. This room presented as one of the calmest, most relaxing areas they had been to in a long time. We had expected to at least feel some residual energy from the fire, but believe that possibly the complete demolition and rennovation removed all of the residual energy that was in this room. It truly felt like a blank canvas waiting for life to imprint it. 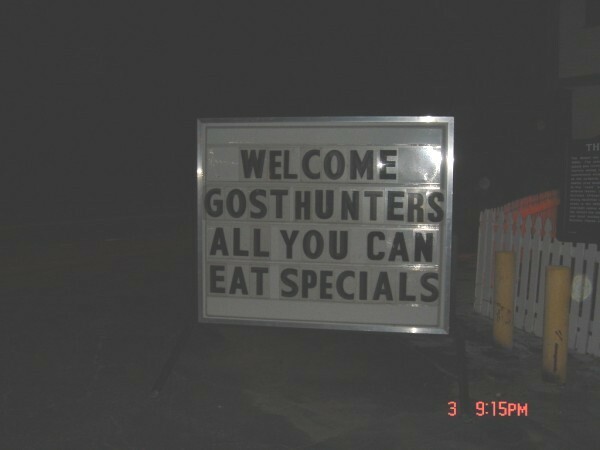 The restaurant was a little harder to investigate, due to the location of this place. Since it is literally, at the crossroads just before the turnpike entrance, there is an excessive amount of traffic which of course produces alot of noise and lights with reflections and shadows. We set out to try and debunk some of the stories about this area. The first was the juke box playing on its own. 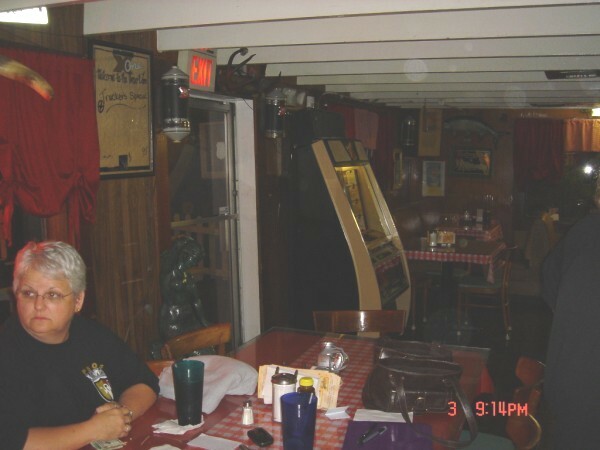 When Mike the manager was questioned, he stated that the juke box was set to play randomly as a way to remind customers that it was there and encourage them to put money in it. The next were the stories of ghosts pushing drinks across the bar, a review of the bar area revealed that the bar was very unlevel and slooped towards the center. We felt that the condensation that accummulates from a drink (we have all seen a drink slide across a table at some time due to this) along with the significant slope of the bar could easily account for these stories. Our team members all relate that the bar, dinning room, kitchen and downstairs office area did not have any significant feel to it and did not experience any unusual activity or any change in EMF or temp readings for this area. The upstairs bordello rooms and museum produced a myriad of feelings within our teams. The front bordello rooms had the same issues with noise and shadows as the bar downstairs. One team member did relate that something rubbed across her calf area while she was sitting in this room. The office and two bedrooms at the top of the stairs also were very quiet, with one member reporting feeling that she was being watched each time she entered this area. There are six rooms along the hallway leading to the bordello, most of these rooms were very quite for the evening, except for room 6, the room that contains the vintage kitchen equipment. The first team reported that upon entering the back half of this room, they would experience goosebumps and their hair standing on end. They returned to this room several times and relate the feeling being the same. The second team, without knowing the first teams reactions, also reported the same feelings to this room. One of the team members also experienced significant heart palpitations in this room. The other team member reports during this time she was getting an increase in EMF readings, up to 1.4 on the meter. (This data was confirmed after a review of the audio recording for this room.) The third team reported the same feelings and also report that when they were in the front hallway by the stairway, they heard a thump from down the hall near this kitchen room. An investigation produced nothing unusual to have accounted for this noise. 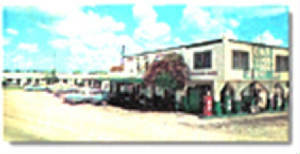 A complete review of the investigative data, revealed a picture in the bar/restuarantof the front booth showing a mist. 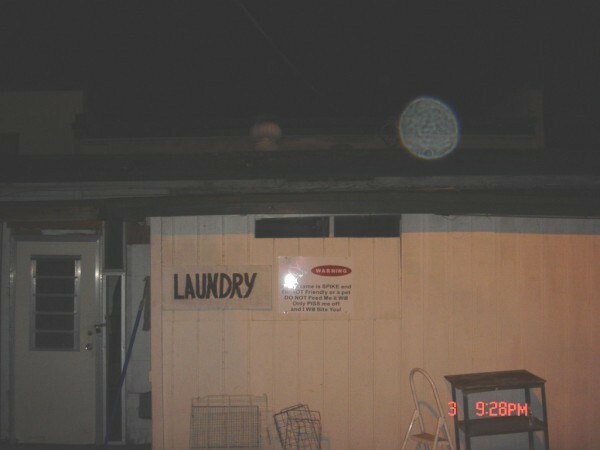 Other photos throughout the evening revealed only dust orbs. The hotel room audio, video and photos did not reveal anything. The upstairs hallway, kitchen room and bordello.